In 2018, a strategy was developed to create 25 miniature libraries for the many students in theological extension classes and for pastors in continuing education in the Philippine/Micronesia Field. The field received a grant last year from the Books for Pastors fund to make the dream into a reality. The strategy included buying the latest books from the Nazarene Foundry. 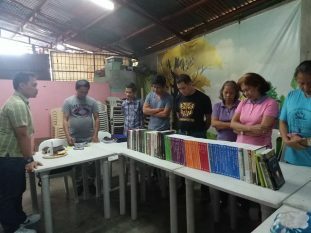 That summer, books were ordered, and through the help of personnel from the Global Ministry Center, the books were shipped from Kansas City to the Philippines. Last week, the books finally arrived. 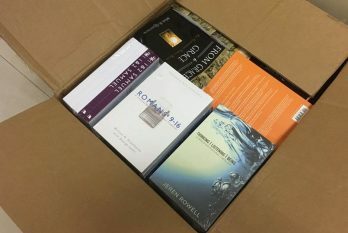 Each of the 12 districts on the field and the libraries at Visayan Nazarene Bible College, Philippine Nazarene College, and Asia-Pacific Nazarene Theological Seminary will receive one set of the 84 books. These books will allow students the opportunity to read books they would never have access to otherwise. The materials will provide students and pastors access to the latest theological and ministry thinking. Currently, there are over 200 students enrolled in extension education sites and 250 students enrolled in theological education at the schools. The Philippines and the islands of Micronesia have over 400 churches, with multiple new church plants each year. Therefore, the need for pastors is great. Many churches are pastored by lay leaders who need more theological training. These books will provide resources to help deepen students’ preparation and practice for ministry.